Lunch break in Yangon. All photos courtesy of The Funnelogy Channel. 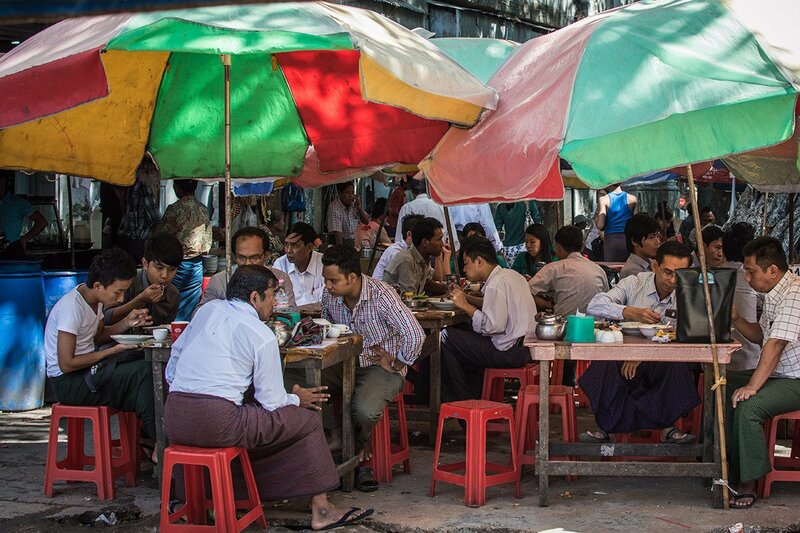 Street food vendors don't stay still for long in Yangon. 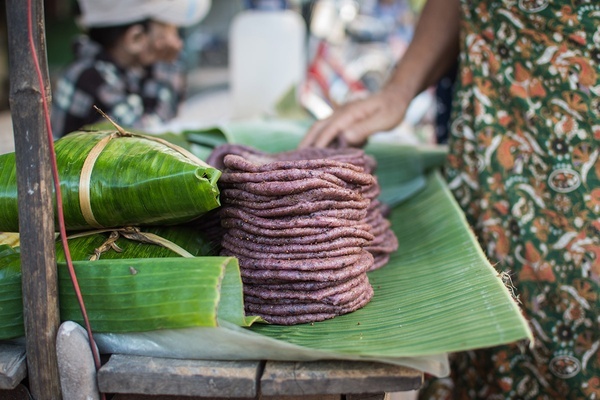 Gabriella Zanzanaini and Nicolas Petit of The Funnelogy Channel, one of Fathom's 24 Best Blogs and Websites 2015, give us an hour-by-hour guide to the best street snacks in Myanmar's capital. YANGON, Myanmar – Not one to hit the snooze button again and again, Yangon is an early bird. The short and narrow streets of Chinatown sit side-by-side in tidy rows, rickshaws riding through slow and steady. Block after block of colonial houses persist, their faded tangerine and turquoise walls peeling like egg shells, the crawling ivy holding up cracked terraces. It's 6 a.m., and the sky is still a gentle porcelain blue when a swarm of pigeons swoop in to fight for corn in a woman's hand. A flurry of grey and white feathers reascend as rapidly as they dive back onto the electrical wires while they wait for their next handful. As they sit, they look like notes from a musical composition, rows of lines and black dots ready to dance again when the conductor demands. Everywhere downtown, people on their way to work purchase cans of feed and scatter them as a gesture of good faith, fueling an avian takeover of the city. Feeding the birds equals bonus karma points, a win-win for all. On every corner of Anawratha Road from 9th Street to 14th Street, breakfast is sizzling, boiling, or steaming. 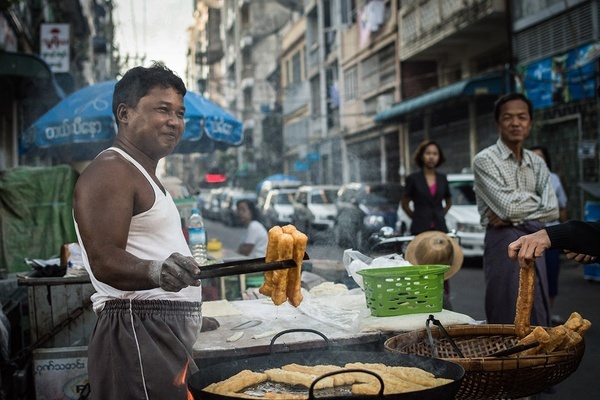 Yangon street food vendors are the kings and queens of the pop-up. Their businesses take them wherever they may go. The necessary equipment sets up in a matter of minutes. Unlike in other cities, street food vendors are mobile every few hours. The face and smell of a street changes every time we walk down it. A different hour, a different menu. A street vendor selling e kya kway. Deep-fried breadsticks, a version of the Chinese youtiao, are a breakfast favorite. Like a light savory donut, they are often dipped in tea or coffee and served with congee (rice porridge) or Myanmar's favorite fish and noodle soup, mohinga. The story behind their paired vertical shape is inspired by a voodoo doll concept. During the Song Dynasty, a couple plotted to destroy a great general. As a symbolic protest against the couple, the youtiao was made into two human-shaped pieces of dough to be deep-fried and eaten in revenge. This evolved into two rolls joined at the middle: The couple, hand in hand. Myanmar lies between India and China, and the influences of both powers are evident in the faces of its people, customs, and, above all, in its cuisine. From the Indian side of the spectrum comes roti. Various shapes of ghee-enriched dough are stretched out, pounded, and laid out. The round ones are topped with savory mung bean paste, the rolls are filled with an egg, and the twirled ones are drizzled with sweet condensed milk. It is hot and oily and crispy and oh so good. Khao sueh thoke. Burmese noodle salad. The sky blue is intense and the black electric cables are empty. The lady in pink with the feed tins and the pigeons have moved on. The big wok of deep frying e kya kway has been replaced with a stand of counterfeit DVDs. The stalls with larger tables and plastic chairs are organizing, some already serving hungry customers an early lunch or a quick snack. When in Chinatown, eat noodles. 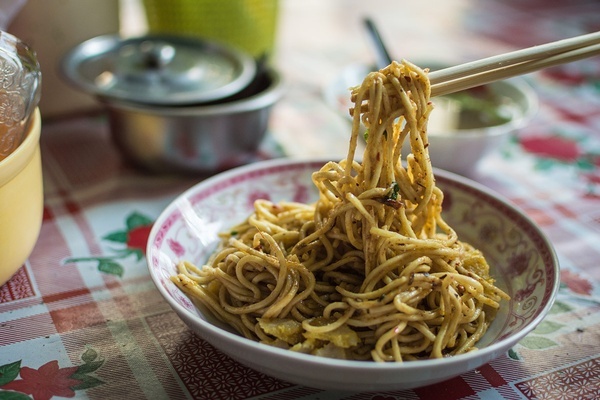 This Burmese dish is a popular example of the country's love affair with noodles and salads. "Thoke" means salad, but the definition is not limited to a bowl of lettuce and tomatoes. 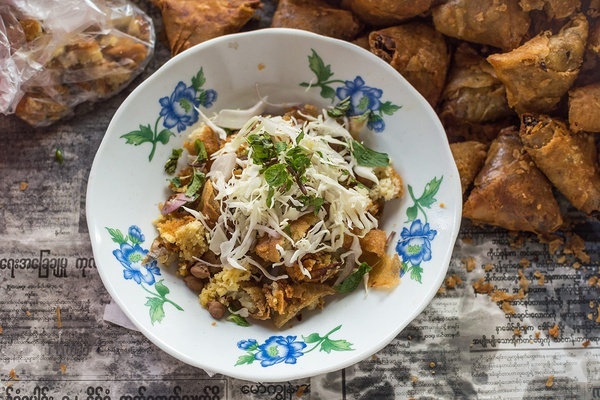 The best of Burmese cuisine is often found in its thokes, and this combination is a great introduction. Wheat noodles are tossed with dried shrimp, shredded cabbage, and carrots before being dressed with fried peanut oil, chillies, fish sauce, coriander, and lime. A pickled mustard greens broth, sour and fermented, often comes on the side to balance the flavors, but don't feel obligated to finish this one. Samosa thoke with lentil broth. The sun is now blazing. We move east, where the streets turn into avenues and the ladies are out running errands. Their elegant longyis (traditional Myanmar dress) are pressed and spotless, and their buns hold strands of flowers, yellow, purple, orange flowers. A Burmese mother once said to her daughter that, "without flowers, you are not fully dressed." In these streets, it still holds true. Our next thoke, a cut-up potato and chick pea samosa, is a star. This is a complex dish like no other, and calling it a salad is misleading. 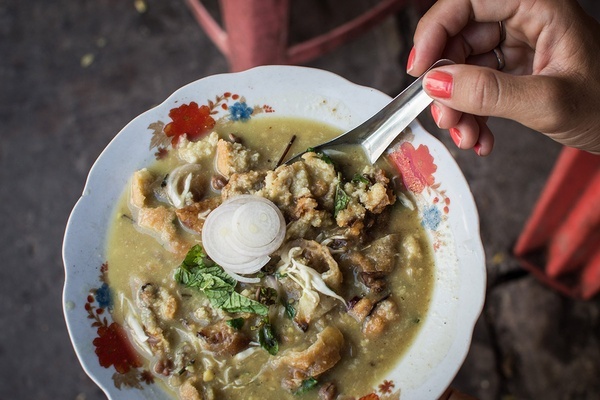 This may be our favorite savory dish in Myanmar. And it's even vegetarian. The crisp pastry of the samosa triangles provides crunch. Their filling and the extra chickpea falafels provide protein and creamy weight. The shredded cabbage, finely chopped raw onions, mint, and coriander bring freshness. Add some chillies for spice, and a squeeze of lime. The final touch is heat and comfort in the form of thick masala lentil soup. There are multiple variations, but the secret to this dish is a touch of cinnamon. Grilled koh può rice cakes. We move further east towards the Strand, where majestic colonial buildings are still rather glorious and house current national ministries. Large ceiling fans swirl above grand stairwells, and civil servants exit through oversized wooden doors, their shirts tucked into their longyis as they head to lunch. The pop-up restaurants here are tidier, giving an appearance of better hygiene and cleaner dishes. (The clientele is more demanding.) The menu is extensive — noodles, soups, rice, curries — but we are more interested in the women sitting by the road. Perching barely taller than a foot, they pop out of nowhere below eye-level with metal bowls full of food packaged with banana leaf. 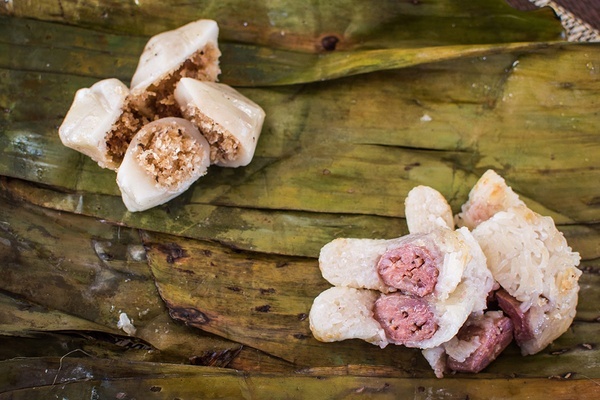 A savory glutinous rice cake with a touch of natural sweetness from coconut added to the mixture. The cake is coated in toasted sesame seeds and served with extra grated fresh coconut and salt and pepper. It sounds like a peculiar mix, but give us anything with a hint of glutinous rice and coconut and we're yours. These are also glutinous rice cakes, but grilled over charcoal. The fire gives them a smoky flavor, a thin crust, and a chewy center. They can be made from black or white glutinous rice (we prefer black) and are topped with a generous dollop of dark jaggery. Jaggery in Myanmar is usually made from toddy palm syrup. The syrup is boiled until it turns a caramel hue and solidifies into chunks of thick sticky sugar. It has a deeper flavor than white sugar and is nicknamed Burmese chocolate. Variations on mont lone yay paw. 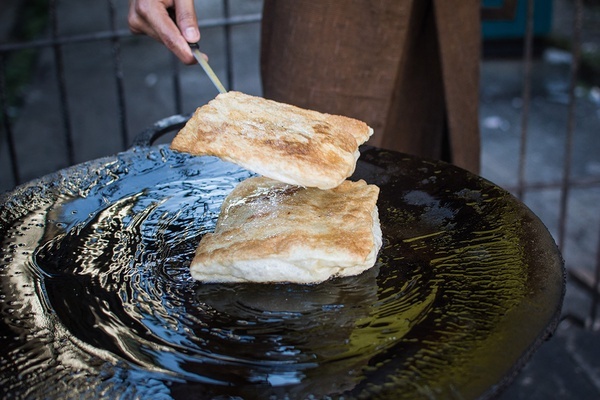 Burmese sweet pancake, bein mont. The lunch crowd goes back to work, and it is tea time. Outside government buildings, professional typists form street offices with tables, chairs, and typewriters. Clients patiently wait as their official documents and letters are typed up before presenting them to the folks upstairs. Those offering handwritten services compose personal letters, their street office composed of a stool and an overturned cardboard box. People resume their shuffling between ministries and the dessert cart lady appears. It is time to satisfy your sweet tooth. Myanmar is not short on desserts. The mont lone yay paw is a close relative of many other Asian desserts. Basically, it's a glutinous rice flour ball with sweet filling, similar to the Chinese tangyuan and the Japanese mochi. Here, they were wrapped in banana leaf and stuffed with jaggery and grated coconut. They are a traditional dessert enjoyed during Thingyan, a week-long Buddhist festival during Burmese New Year. The name for the dessert was inspired by its cooking method (boiling) and literally means "round snack on the water." If you like bananas, you will like kauknyintok. (We don't like bananas and still love kauknyintok.) 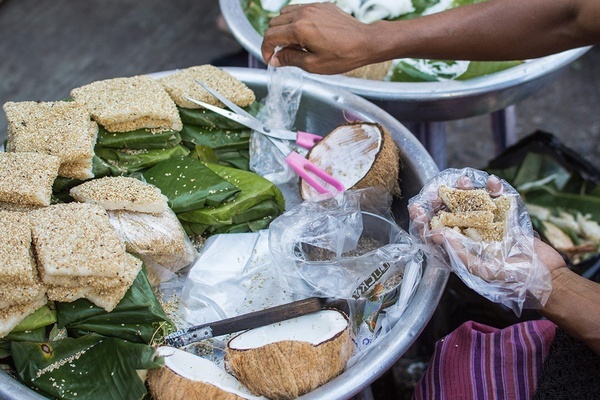 Not overly sweet, the surprisingly delicate dessert involves steaming a banana leaf stuffed with banana pieces, glutinous rice, coconut cream, sugar, and salt. The flavors are subtle, and the banana melts in your mouth. The crème de la crème of Burmese street snacks. No matter what you have done during the day, you deserves a bein mont. This pancake is chewy, fluffy, crispy, nutty, light, and complex at the same time. 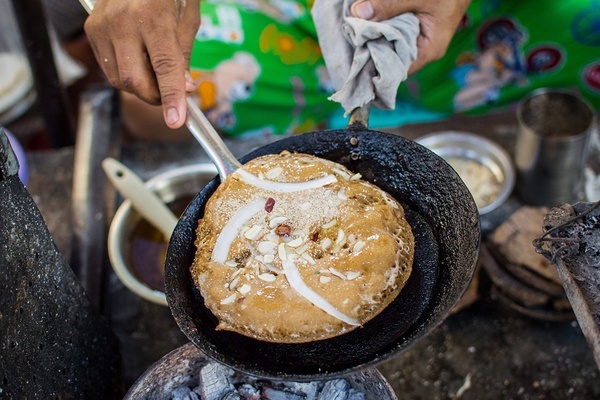 The sweet version is a glutinous rice flour pancake topped with white poppy seeds, slivered almonds, and fresh coconut slices. None of the pancakes we have tried during the pancake frenzy we have seen in the past few years have anything on this one. We are in the throngs of rush hour. The pavements are crowded — flip flops, moccasins, and a few heels pound away in one direction. New restaurants are popping up for dinner. Bamboo sticks lift up new tarpaulin covers, woks appear over portable stoves, and plastic chairs are unstacked onto the pavement and claim a quarter width of the main road as well. On our corner of 11th and Anawratha, the DVD shop has been replaced by a woman in purple. Three stone stoves are burning before her. Cross-legged and surrounded by ingredients, she is flipping dosas. The dosa is another Indian trick up Myanmar's sleeve. Originating in Southern India, the dosa is a thin crispy crepe made from a batter of rice and lentils that is allowed to ferment overnight. The fermentation process increases the nutritional benefit, and the base is naturally gluten-free. 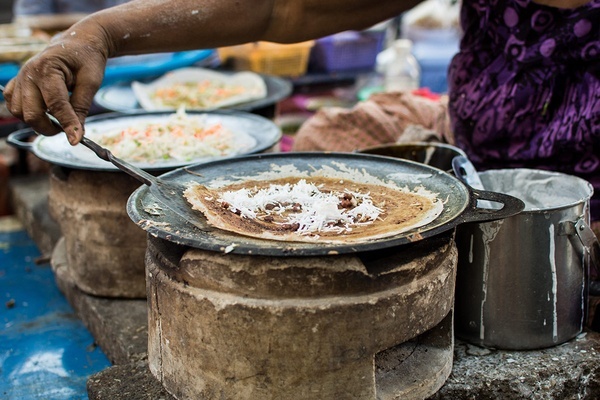 Our purple dosa lady ladles her batter onto a flaming iron skillet and tops the thin layer with carrots, onions, cabbage, bean sprouts, chillies, coriander, and plenty of black pepper. The perfect pre-dinner snack. Yangon is now dark. The teahouses lining the streets are filled with young and old chatting away. Next door, the wok of the pop-up restaurant is flaming, churning out fried rice and noodles for its own tables and the ones of the two teashops down the road. Down the side streets, vendors specializing in hot pot wait for raw food from their buffet to be chosen and placed into red plastic baskets and plunged into boiling broth. The streets are emptying, rickshaws long gone. We spot a few pigeons roaming above before coming down for scraps. Once again, the street has changed its face and its menu — its morning kings replaced by its evening queens. By 9 p.m., they will all be clearing up, closing down, and going home to get ready to wake again with the sun tomorrow. This story was edited for length and clarity and republished with permission from The Funnelogy Channel.